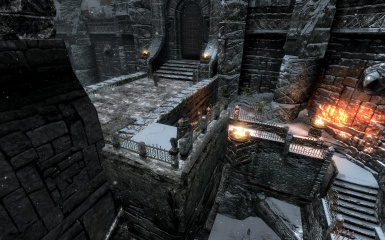 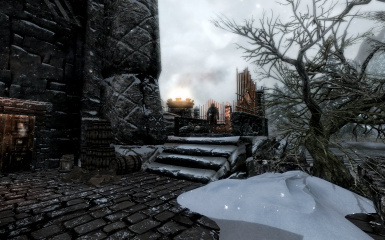 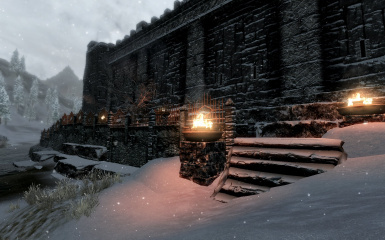 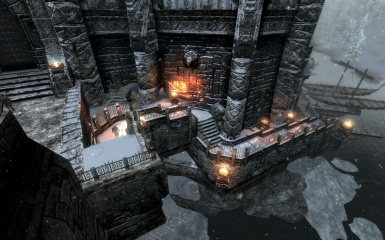 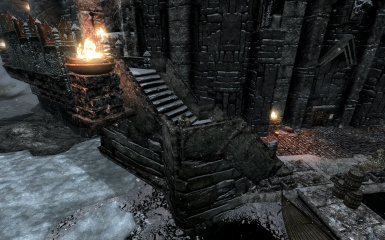 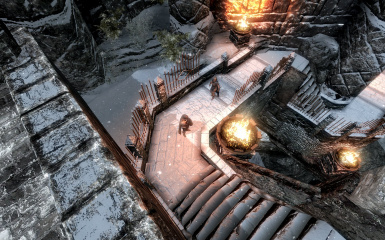 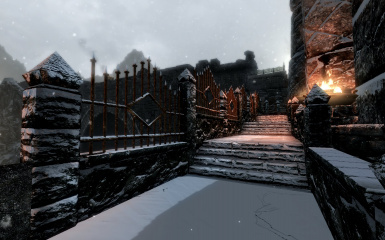 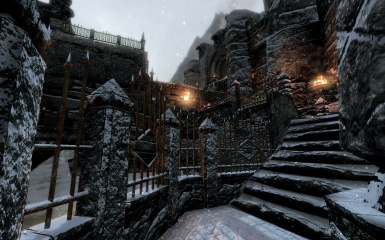 This mod adds a multi-level set of stone stairs and walkways alongside parts of the exterior Southern and Eastern walls of Windhelm, connecting the main bridge with the docks and the docks with the edge of the mainland to the north and east of the city that leads to a path that will take you eventually to Winterhold. 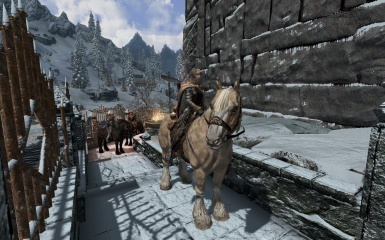 The walkways are fully navmeshed for followers and are able to be used by those on horseback without having to dismount, although it can get a bit crowded in a few spots if you hit NPC rush hour at just the wrong time and place. 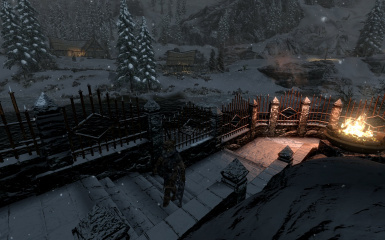 There are a 2 additional guards added to the walkways for ambience and security from any wildlife, be it on land or of the flying variety. 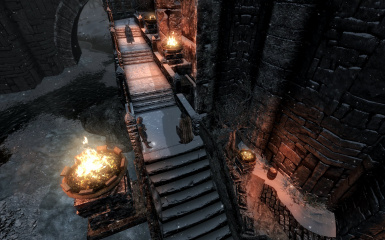 Also, the dock patrols that exist in the game already have been adjusted to account for the new pathways that need to be secured. 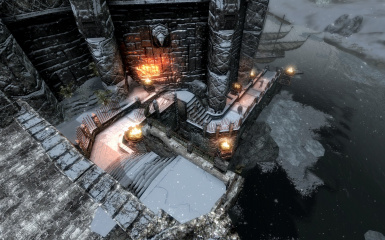 Action and Idle markers have been added in a few spots to allow for some randomness in how NPCs move in and around the paths, also some of the original dockside clutter has been removed or repositioned to allow for smooth navigation along the main travel paths for both NPCs and the player. 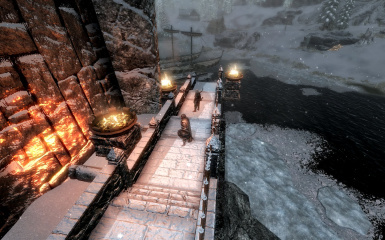 I almost never use Fast Travel in my games so it always bothered me how difficult it was to get to and from the Windhelm docks from anywhere but the interior of the city as well as the fact that there was no connection from the docks or city to the side route that heads North up towards Winterhold through the snowy fields on that side of the city. 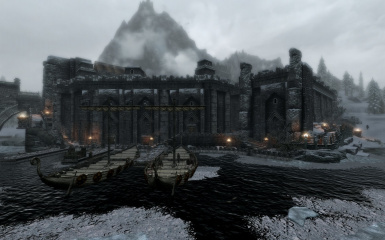 Instead you were expected to make a long, dangerous, and very out of the way loop far to the West just to get back on track for travel between those two cities. 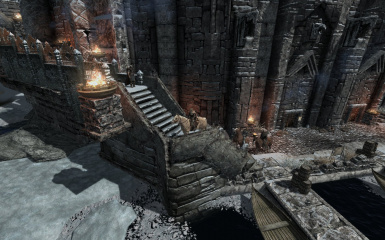 In a similar annoying fashion, rather than ariving by carriage and being able to easily head down to the docks to catch a ship you were expected to either enter the city or risk a broken leg by jumping off the main bridge to get to the docks or freezing your unmentionables off if you wanted to head north. 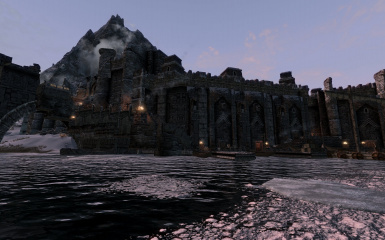 Want to go the other way, arriving at the docks from Solstheim or from points north such as Winterhold and want to head up to the stables or on past them to the main roads in order to travel elsewhere in Skyrim? 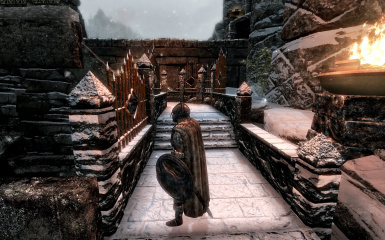 Tough luck, you'll just have to enter the city instead of skipping it even if you have no current business inside. 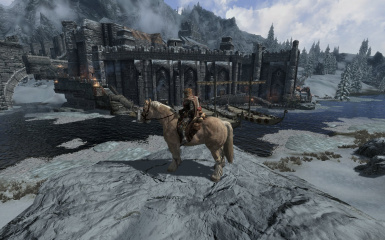 What about if you're on horseback? 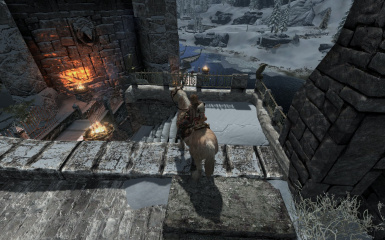 Guess you'll have to dismount and have your horse teleport to you, hmm? 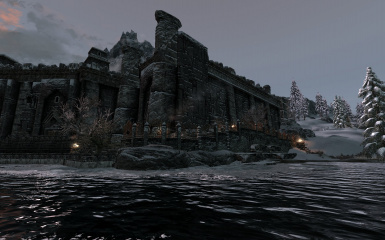 And if you happen to use a mod such as Frostfall that makes it so you really don't want to go swimming in frigid waters for even a moment, well those quick and simple toe dips in that icy water surrounding the docks aren't all that simple anymore are they? 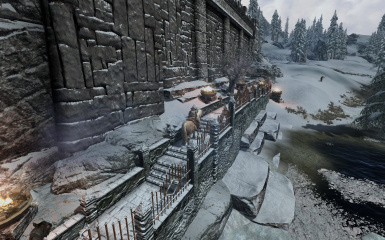 Something to be aware of if you have the Dragonborn Official DLC installed is the fact that because there are additional markers and locations for NPC actions as well as a seperate path up to the main route in/out of the city added by this mod, some NPCs added to the docks by that DLC can take a path you wouldn't normally expect when they have wander or sandbox packages active. 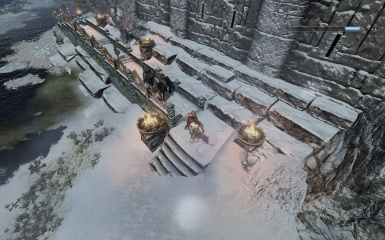 If you think an NPC is missing from where they are supposed to be, check along the new paths as they can choose to take these alternate paths at times so they might not be found where you'd normally expect them to be. 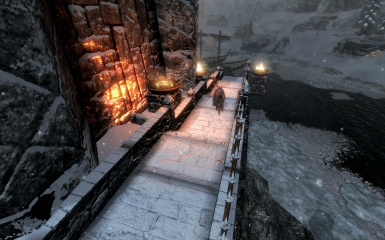 I have also seen NPCs from a few other mods that add wandering or moving NPCs (such as Travelers of Skyrim) and a few that are in the base game take this alternate route on occasion during my testing. 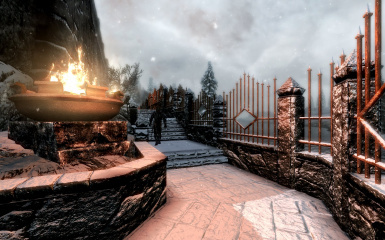 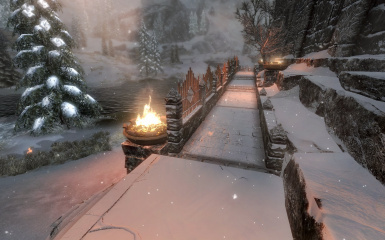 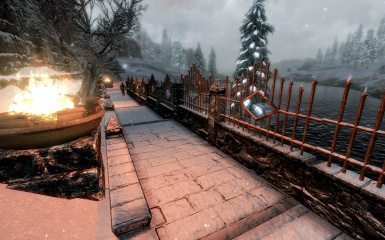 If you use Open Cities Skyrim, this can happen much more often as the NPCs normally present in the closed interior version of the city are now present in the main game world and so can and will see and make use of the new pathways and markers outside where they wouldn't from the closed version of the city even with navmesh conflicts. 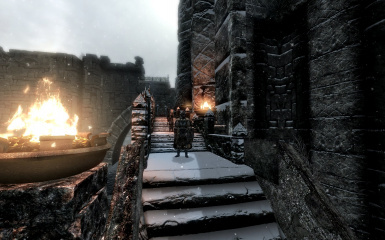 If you notice a conflict with another mod post in the comments and I'll look at the situation and potentially patch the problem if it is possible for me to do so. 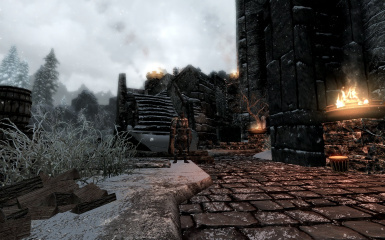 Those mods that are known to conflict or be compatible, either on their own or with the help of a patch are listed below.